I'm so excited to share this next Foxy Friends interview with you! 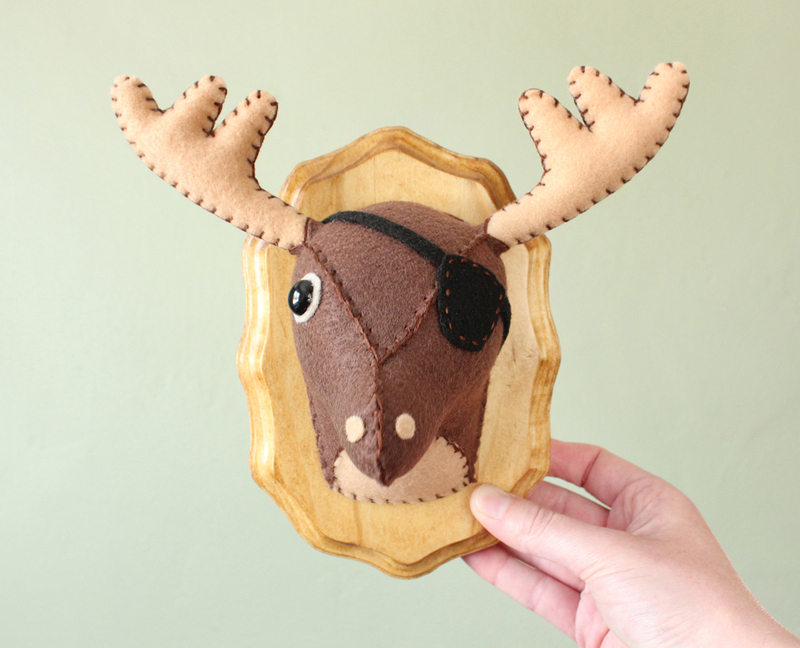 If you are a longtime follower of my blog, you probably know how much I love faux taxidermy animal crafts. 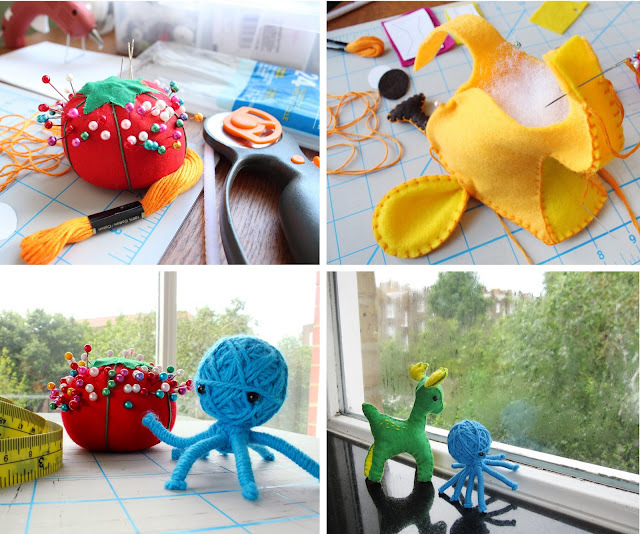 I'd seen AI Creatures featured in treasuries and through my own searches on Etsy. So when I decided to bring back these spotlight posts, they were the first shop I contacted! 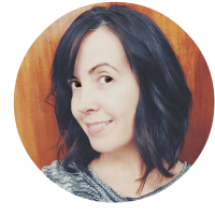 I am The Creature Specialist - also known as Bree - a Los Angeles native who is temporarily living in London, England. 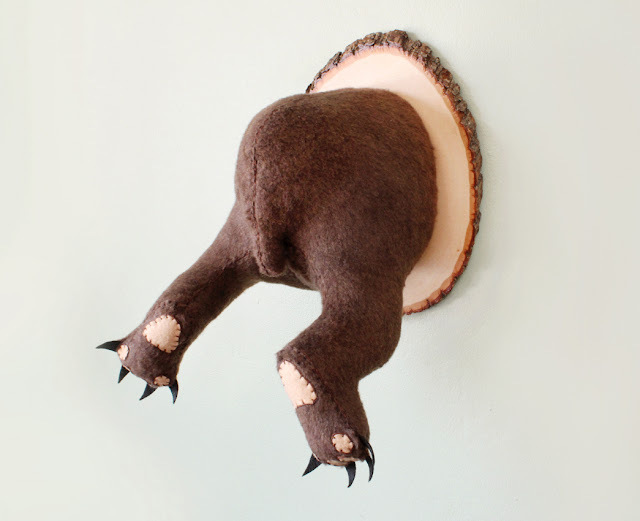 My Etsy shop Anatomically Incorrect Creatures, or AICreatures for short, started in 2010 as a way to bring a unique and humorous mix of environmentally friendly home decor and hybrid creature whimsy in the form of hand-stitched faux taxidermy. By 2011, my shop grew to the point where I was able to hire my brother The Master Crafter of Awesome – also known as Andrew – to create all the creatures’ wood plaques by hand. Together we are able to produce a product that is fully handmade, a tad geeky and full of awesomeness! 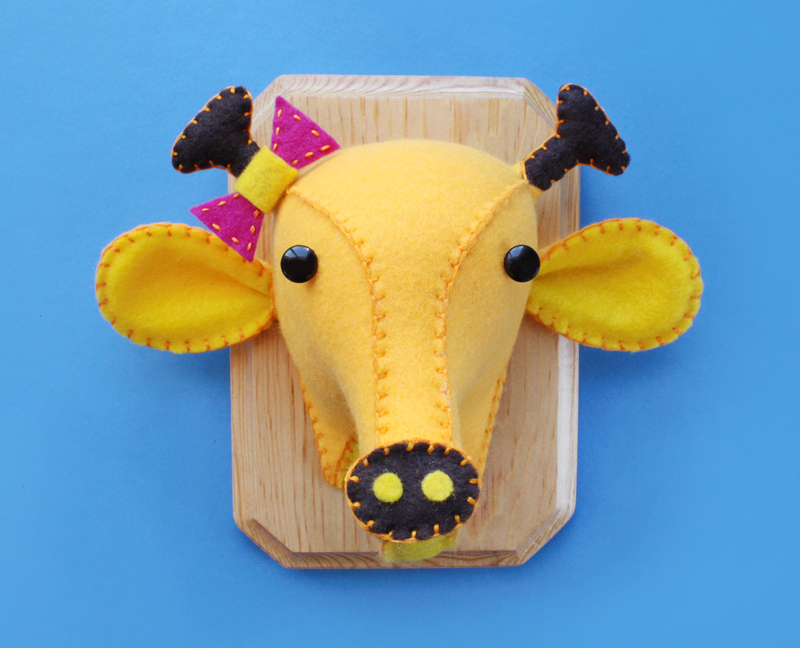 With so many cute creatures in your Etsy shop, do you have a favorite? That’s a tough question to answer it would be like choosing which child is the cutest. I do have a special place in my heart for the more geeky creatures that I have made, including, A Mighty Bear’s Behind, Head Of The Wampa and Captain Blackheart Brown-Deer. I also really like the hybrid creatures, such as, Georgina The Giraffelephant who is part giraffe and part elephant. I recently left my bright and sunny Los Angeles studio behind and I am now working in my new London studio – where I will be living for the next two years. I miss the sun and palm trees, but all the clouds and drizzle does allow me to have a beautiful view of a lush green garden and trees. I have been creating for many years and I went to art school to study fine art. It wasn’t until 2010 that heard about Etsy and the potential to sell handmade products to a global market place, that I actually started my shop. Currently, I am enjoying exploring my new home in London. There is so much to see here and I feel very much like tourist, even though I live here now. I am also a bit of a book nerd and love to read during any down time I have. In fact, one of the first things that I did in London was obtain two library cards from two different London libraries! I created a series of hybrid creatures for an art project and one of them was called The Anatomically Incorrect Frog Lemon Spider – he had 6 legs, a lemon shaped body and frog eyes. I thought Anatomically Incorrect Creatures was a fitting name for the shop considering the hybrid nature of the creatures that I create. Working from home. It sounds ideal right? Well, it’s a bit of challenge to set up a strict working (and eating) routine and not get distracted or on the other hand, work too much. When you are running an online business that ships internationally, you can receive orders at any time of the day or night and it’s a difficult balance of work and home to maintain. I’m not sure I have fully found that balance, because I tend to work 7 days a week. I did hear that when you run your own business you always get half the day off, you just get to pick which 12 hours that is! a) scent – Vanilla and also the smell of fresh brewed coffee. b) movie – Hard to pick one movie, but my favorite directors are the weirdoes like David Cronenberg and David Lynch. c) blog/website -- Hyperbole and a Half is perhaps the greatest blog ever. Ali Brosh’s combination of humor and seemingly simplistic yet actually complex drawings will have you laughing so hard you will cry. Check out her “best of” section to get started. d) guilty pleasures – Country music and tawdry novels. The tendency of an artist is to stay really protective and isolated about their work for fear of others copying them, but the best way to run an Etsy shop is to talk to and share your ideas with others that are currently running their own shops. The more actively you can make friends, share your ideas and gain information from others, the better your shop will be. Check out the Etsy forum and find teams that work with similar materials to you. Just remember, people might try to steal your ideas, but no one can ever make something exactly like you – it’s the beauty of the “hand” in handmade. Bree is graciously offering Little Gray Fox readers 10% off their purchase through August 1st 2012 by entering the code GRAYFOX at checkout. 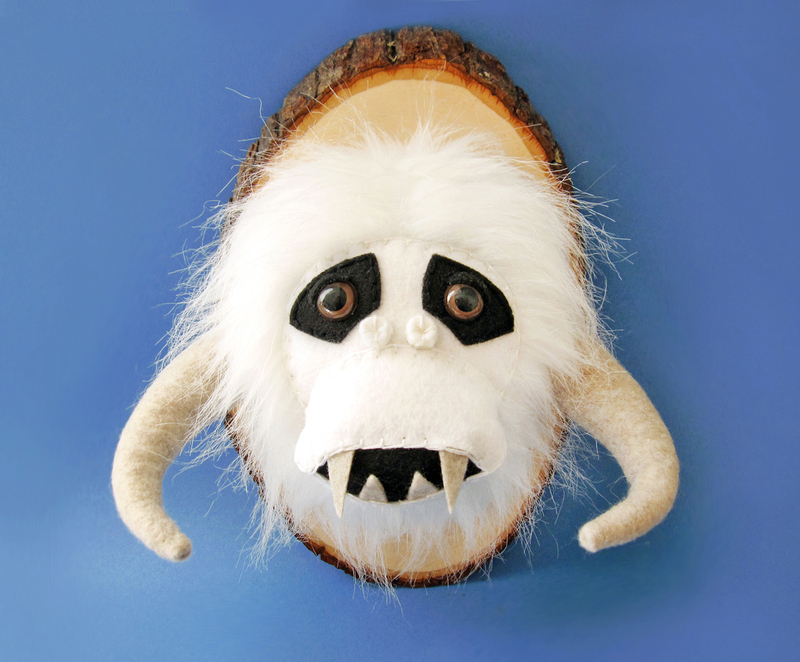 Dude--I love sewn taxidermy--and this stuff is hilarious! BRB, I'll be hearting a lot of it. The bear's behind is pretty hilarious.